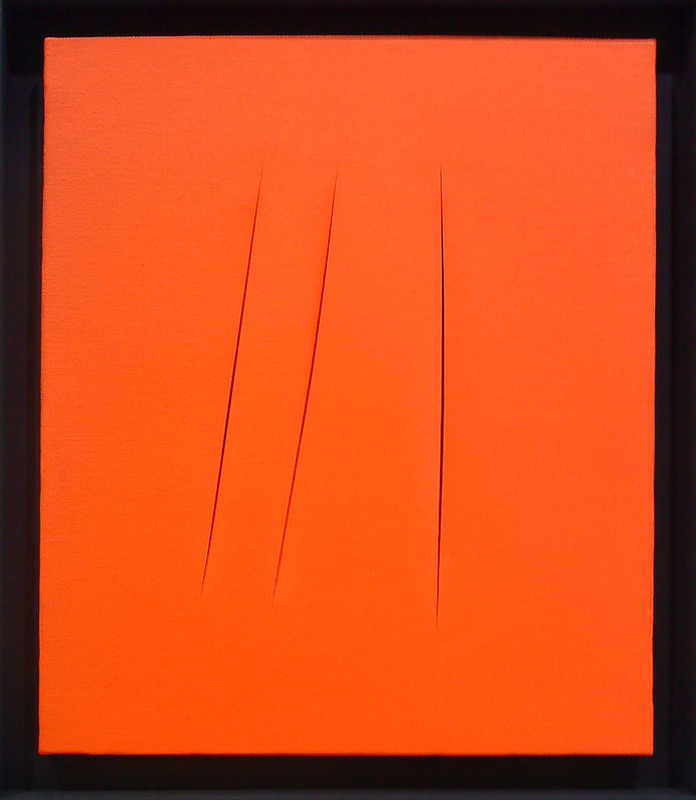 Was Lucio Fontana the first person to slash a canvas? I could just google it I know, but the point is that I associate it with him exclusively, like a trademark. But there were others just outside the spotlight who followed who developed his idea. 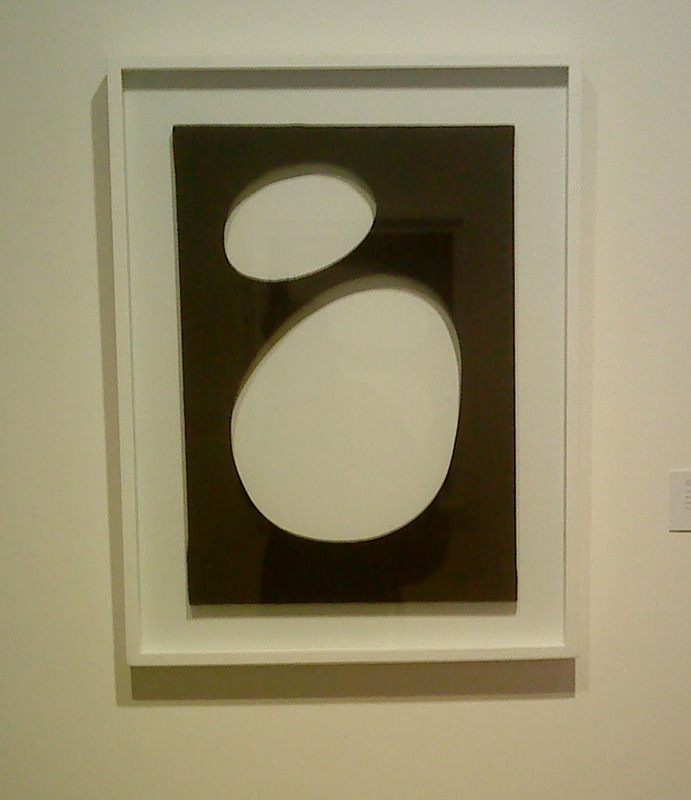 Fontana is easy to see as negative – attacking the flat surface of the picture rather than creating a sculptural object with a certain form. He was undermining the wholeness of the illusion of space through perspective on a picture plane that for centuries dominated in western art. Picasso and Braque had fractured the picture window with Cubism, but Fontana penetrated it, ripped a wound in it that can never heal. On the other hand you could say that he was not attacking, but paring down the art object to its minimal conclusion if you can separate the work from the emotion of the gesture. I incline to the former position, but Eyeball Junior (who has only recently taken an interest in art) is more for the latter. 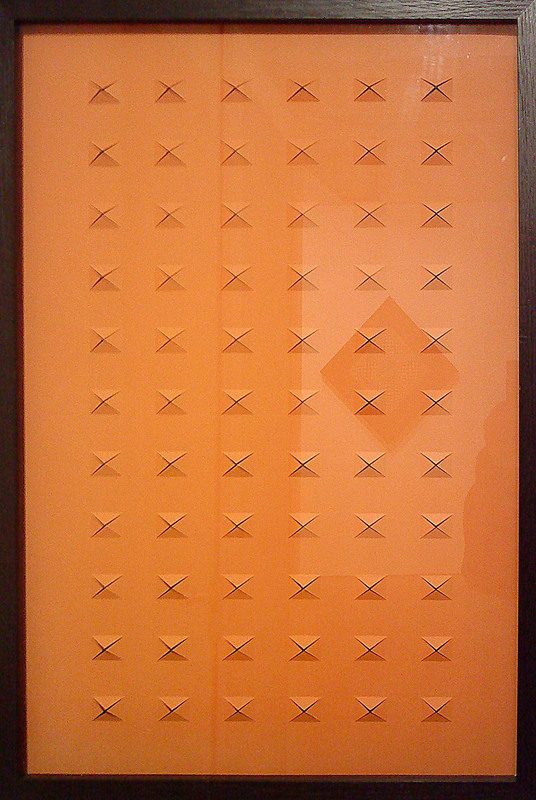 I do burn with curiosity about Fontana’s working day. Did he paint a canvas, then slash it. Paint up a few the night before and then slash before breakfast and spend the rest of the day with his feet up? One slash or three? On plain canvas, or orange? How did he decide? What were his thought processes? Anyway, what of the other artists: followers, contemporaries? I was fascinated by the show at the Roncini gallery last year featuring the work of Paulo Scheggi, of whom I knew nothing. He died sadly aged only 31 in 1971, but created some fascinating work. He often layered canvases with holes, organic and mechanical which sit in the area between sculpture and painting – a kind of minimalist relief. They are subtle and generate wonderful shadows and rhythms with layered depth. 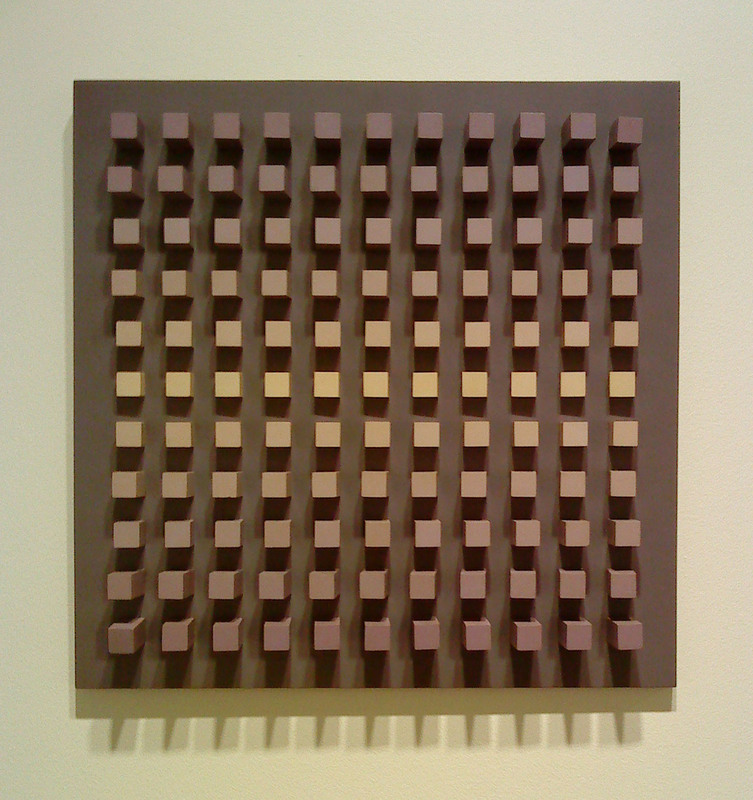 The echoes of op art are plain, but this is not about illusion. 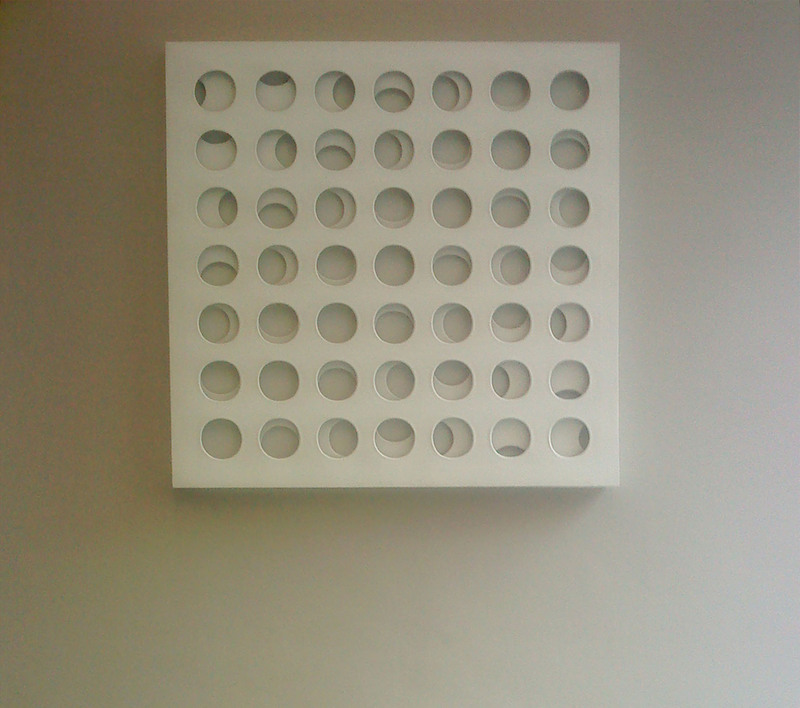 It is about cyclical relationships, a very sculptural reality exploding from the wall – home of the flat picture. Dadamaino (Edoarda Emilia Maino) is an interesting artist too. Experimenting with these ideas and taking a little from earlier artists like Arp they are quietly sensual works that retain the coolness of minimalism. As Bart Simpson reminds us ‘The hole’s only natural enemy is the pile…’ but Dadamaino has works that use projecting objects as well, like these gently turning cubes…they catch the light beautifully and again the shadow seems an integral part of the picture – a genuinely exciting idea to me. Do these works grip me like Picasso or Pollock? Well, it has taken me a while to get to like this kind of thing, but sometimes quiet works speak more clearly than noisy ones. This entry was posted in Abstract, Art, London, Uncategorized and tagged 1960s, Abstract, Art, Dadamaino, Fontana, Galleries, Italy, Lucio Fontana, Minimalism, Op-Art, Painting, Paulo Scheggi, Picasso, Roncini, Scheggi, slash, Sotheby's S2.